As there are simply too many nice cafes to visit in Korea, I’m just going to list some of them that I’ve been to, during my 5 days trip to Korea. Most of them are cafes which we stopped over for drinks or dessert. 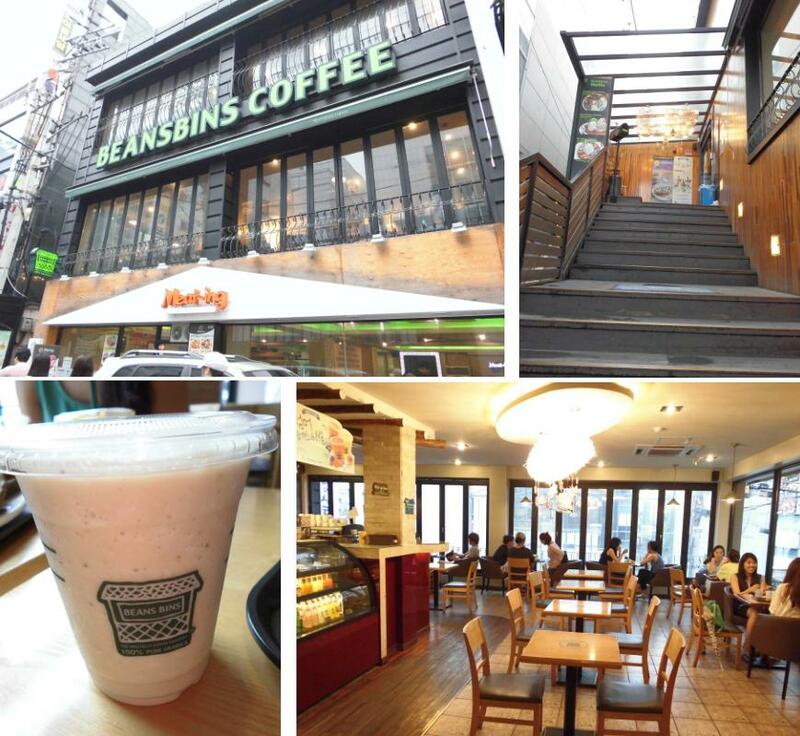 Beans Bins can be found all around Seoul, it’s a speciality coffee and waffles café chain. We went to the outlet in Hongdae, which is located on the second level. 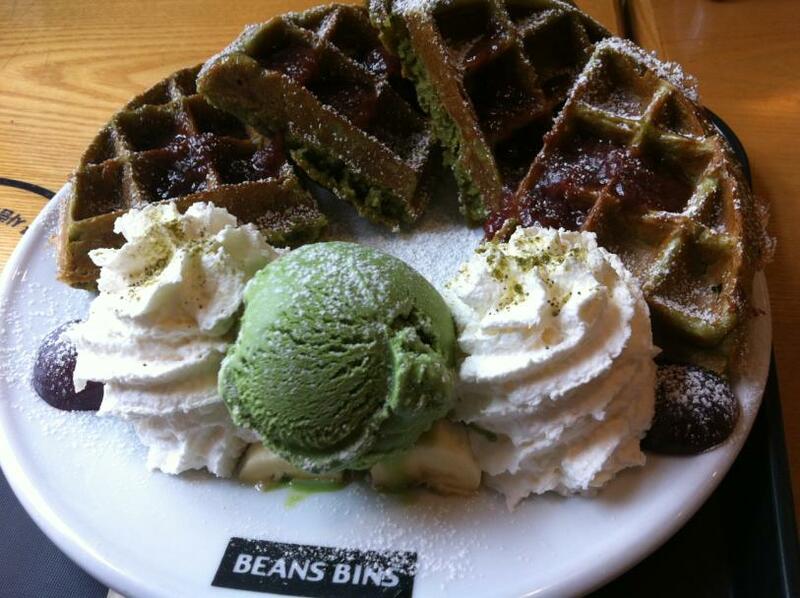 As my friends are green tea lovers, we ordered the green tea waffle with green tea ice cream. Though I’m not a green tea fan, but I felt that this waffle is worth trying and surprisingly it tasted great! Firm and warm waffles, crispy on the outside and soft inside. As for my drinks, I ordered a banana nut milkshake which tasted exactly as what I expected it to be. 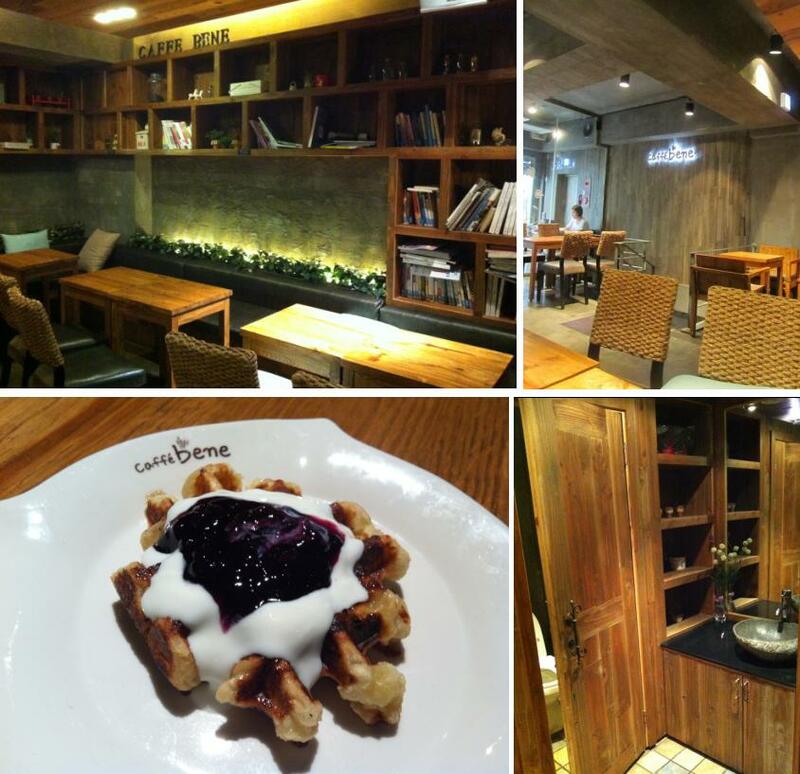 Caffé Bene is another coffeehouse chain in Seoul. 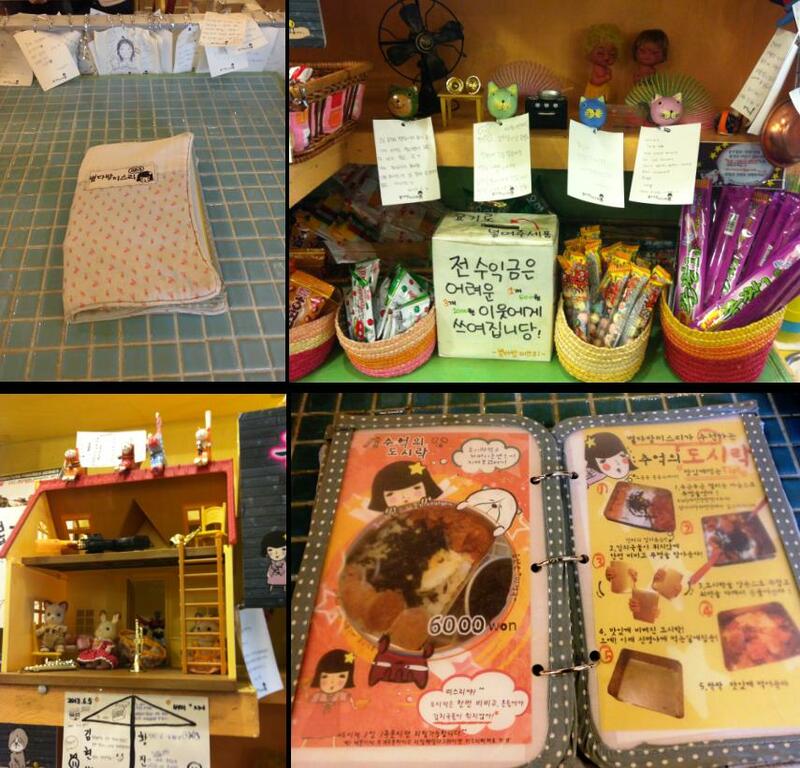 This is my favorite café in Korea! We went to the outlet in Ehwa. To arrive at this place, take the Seoul subway and alight at Ehwa Women’s University (exit 2). 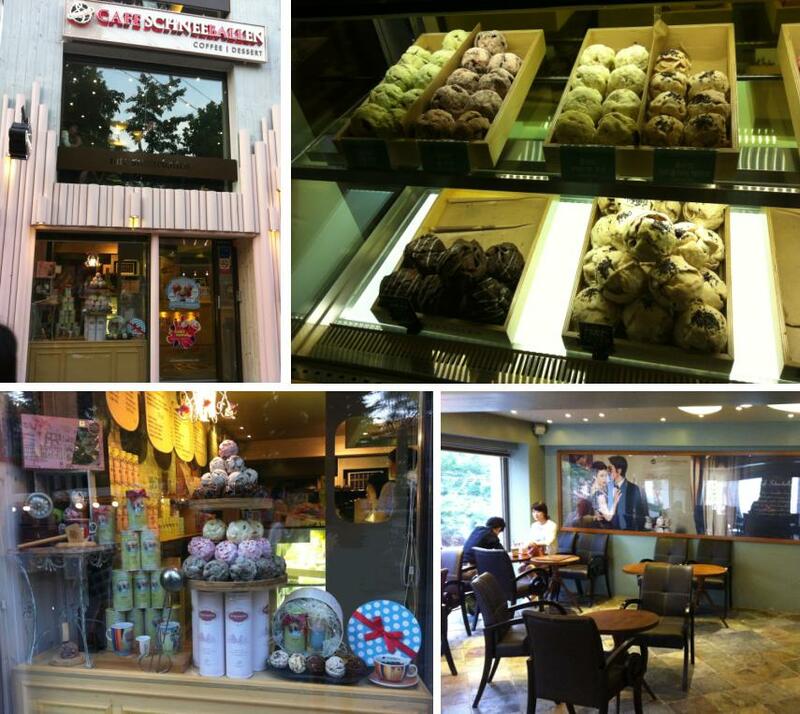 The café is situated outside Ehwa Women’s University, just beside Zoo Coffee. This café is so special and cozy, I was reluctant to leave! And did I mention that the food is fantastic too?? 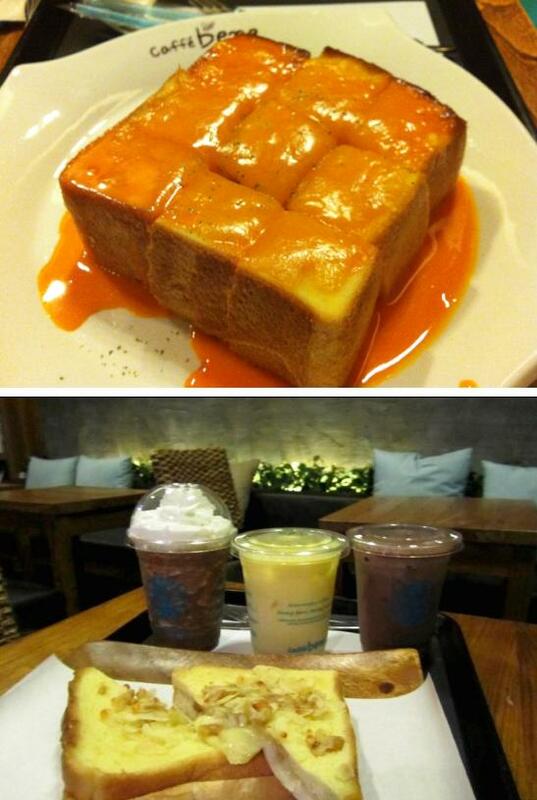 Their honey cheese thick toast is out of this world, I can never find such great tasting thick toast in Singapore. The blueberry yoghurt waffles are amazingly nice too. The outlet in Ehwa has 2 levels and we are seated on the 2nd level where the bookshelves are. This is the first level in Caffé Bene. There is even a desktop for customers to surf the web or for students to do some research while drinking their coffee. The 2nd level of Caffe Bene where we had our brunch at the cozy corner. Miss Lee Cafe is famous for their Lunch Box Meal and if you are a follower of the ‘We Got Married’ Korean reality Tv programme, you should definitely visit this café. We visited the outlet in Myeongdong. 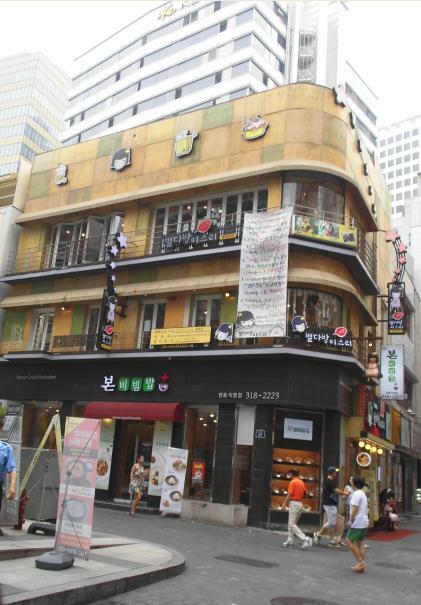 It is situated towards the end of Myeongdong shopping area. Nearest train station would be Myeongdong station. 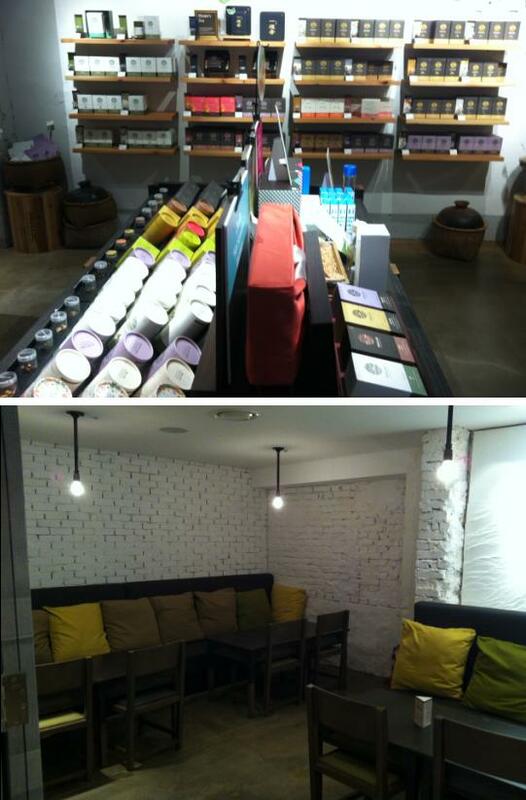 There’s another outlet at Insadong though. This is ranked my 2nd favourite café out of all the cafes that I’ve been to during this trip. 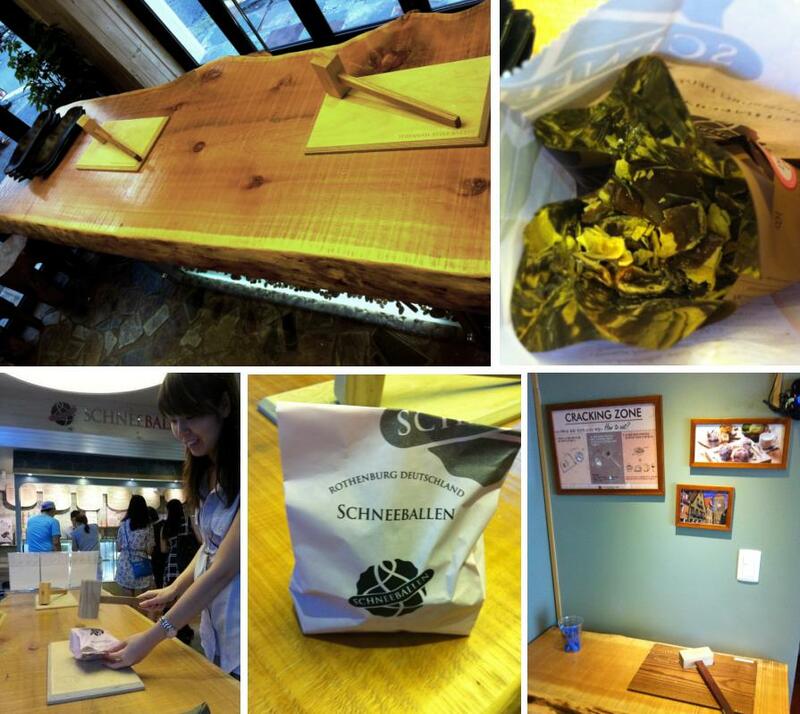 It is another special café which serves very delicious lunch box Kimchi rice. I am not a fan of kimchi and don’t like kimchi, but this rice lunch box meal tasted exceptionally good and do not have the sour taste of kimchi at all because the kimchi in this lunch box is thoroughly cooked. My friends and I missed this lunch box meal very much when we were back to Singapore. Their refreshing dessert contains countless of ingredients which surprisingly tasted great with everything mixed together. The dessert (top left), which contains countless ingredients, consists of watermelon, banana, kiwi, mochi, coco crunch, red bean, ice cream, sun flower seeds, pineapple, cherry tomatoes and other ingredients which I lost count! 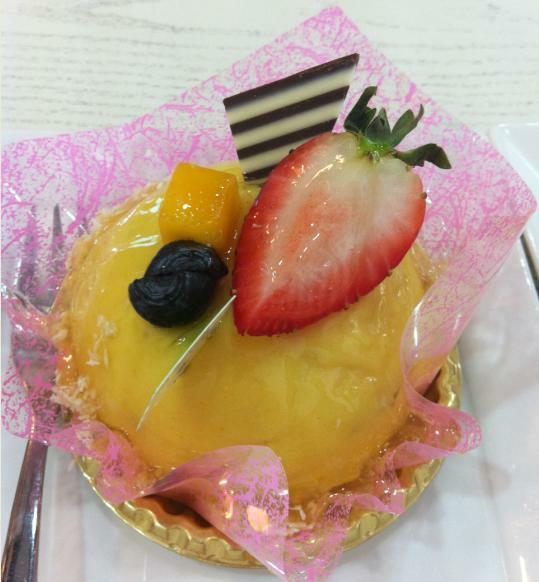 This sweet dessert is cold and refreshing especially during the hot summer in Seoul. 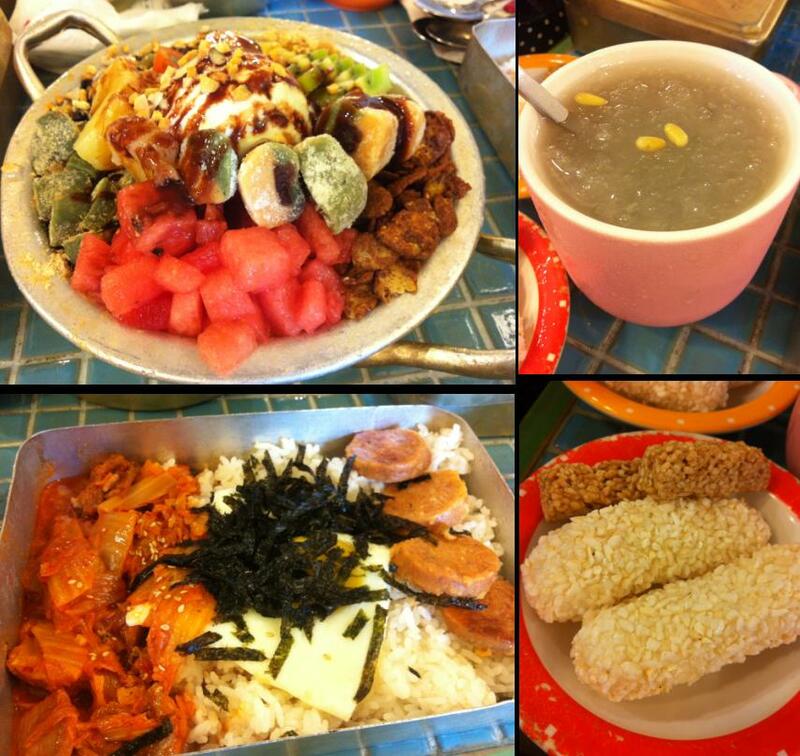 The Lunch box kimchi rice (bottom left), consisted mainly of kimchi, seaweed, sunny-side-up egg and luncheon meat. This simple lunch box rice is so addictive I could eat it everyday. The rice barley drink (top right) is cooling and mildly sweet. The coconut & sesame biscuit (bottom right) is too hard for us. None of us liked this biscuit. 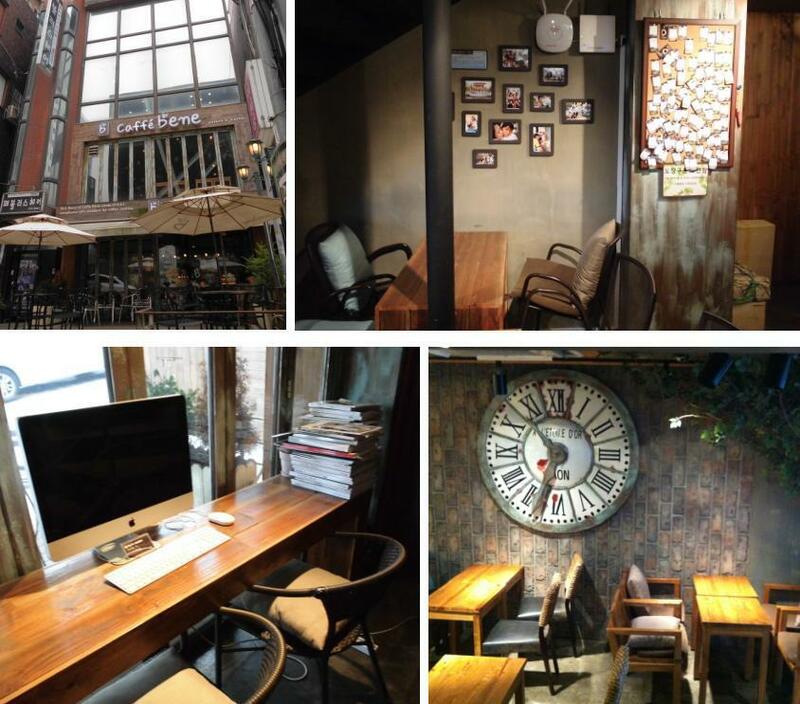 We managed to find this café in Hongdae after searching for it. We first knew about this café when we searched online and heard good reviews about it. This is actually a pastry originating from Germany. This German cookie looks like a snowball and besides the classical ones dusted with confectioner’s sugar, there are recipes glazed with chocolate and nuts. What was fun about this café is that you get to ‘smash’ the cookie up at the cracking zone. We ordered one chocolate ball to share; its texture is like the magnum ice cream’s chocolate coating, cold and flaky, after it had been cracked. 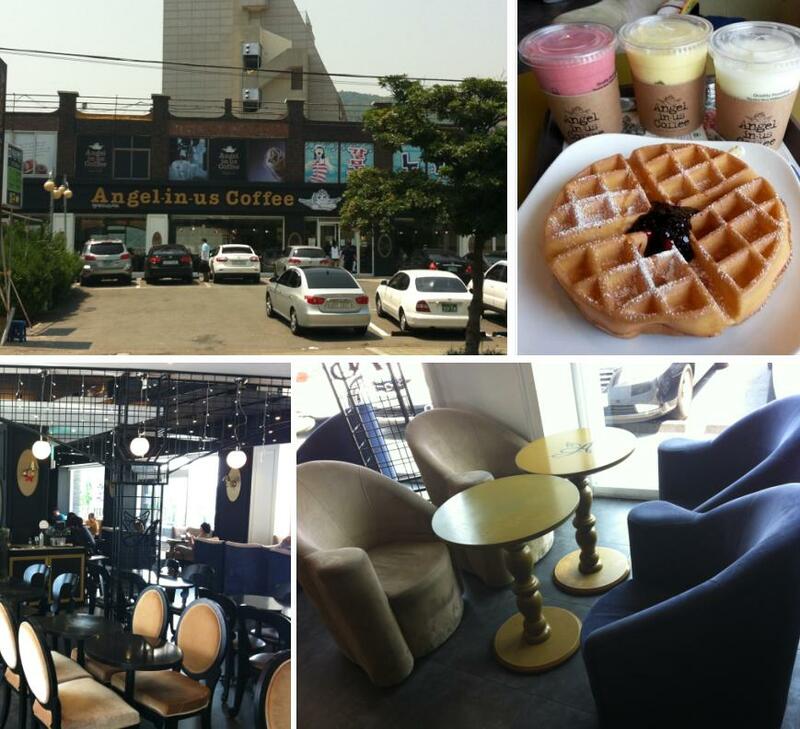 We always wanted to visit the Angel-in-us coffee in Seoul as we heard that their waffles are superb. However, there are simply too many cafes in Hongdae that we did not managed to visit Angel-in-us, not until we went to Busan. 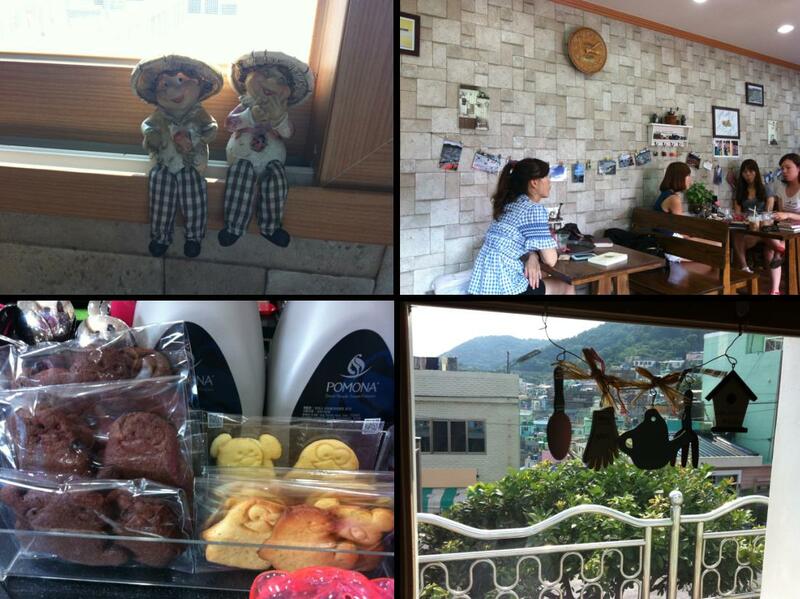 We happened to spot this café and took a break after we finished our scenery viewing at Taejongdae. You can take bus no. 101 from the bus stop opposite Busan train station and alight at Taejongdae (태종대). You can easily spot this café from across the street. Sad to say, their waffles tasted nothing out of the ordinary. Probably I had high expectations of this café. However, my friend loved their lime yoghurt drink a lot. It is highly recommended. The berry yoghurt drink tasted good too, you might want to try it too. Take-out coffee is a small unique café that we discovered within Gamcheon Culture village. To get to Gamcheon Culture village, take Subway Line 1 (accessible from Busan Station) to Toseong Station. Come out from Exit 6. You will be facing an intersection. Turn right at the corner and walk straight. You will see a hospital on your right. The bus stop is right in front of the hospital. Take either Bus 2 or 2-2. This will take you to Gamcheon Culture Village at top of the hill. I was quite fascinated with this café although they sell ordinary smoothie drinks and certain biscuits. 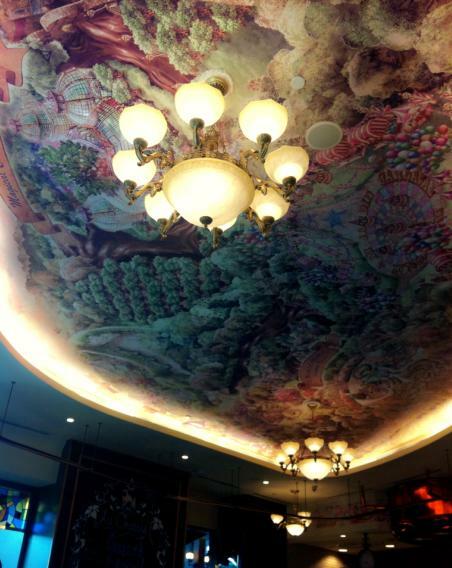 This is because the whole café is very nicely decorated. 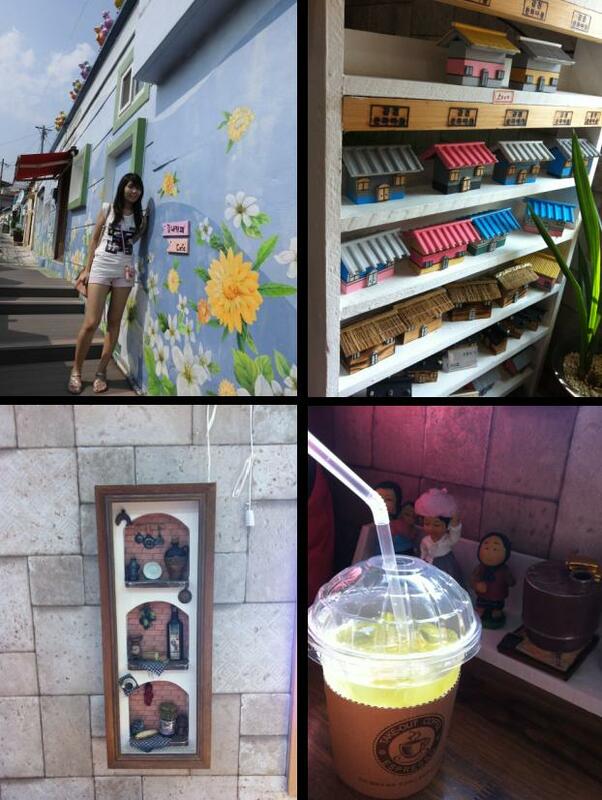 (From top left) At the corridor of the café, walls are painted with beautiful flowers. We ordered a refreshing lime juice drink to quench our thirst. (bottom right). 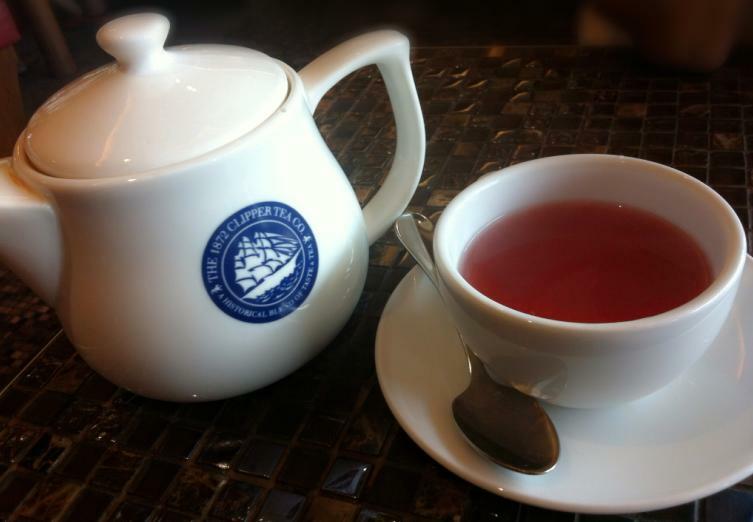 O’sulloc is a place where tea lovers should go! If you are a green tea lover, you definitely must try their green tea latte and ice cream. How to get there: Take the Seoul Subway line 4 and alight at Myeongdong Station, Exit 6. Upon exiting the station, turn left onto Myeongdong 8-gil. Go straight about 400m, until you see O´sulloc Tea House on the right. The Tea house sells a wide variety of tea and there are sample tea leaves for customers to smell the fragrance. 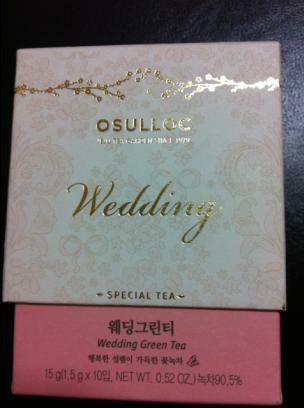 My favorite tea would be the Wedding Green Tea. This tea is highly recommended for people who love floral rose fragrance. The floral fragrance is sweet and dreamy, giving a hint of rose petals and marigold. It is 15,000 won per box (10 individually wrapped sachets). 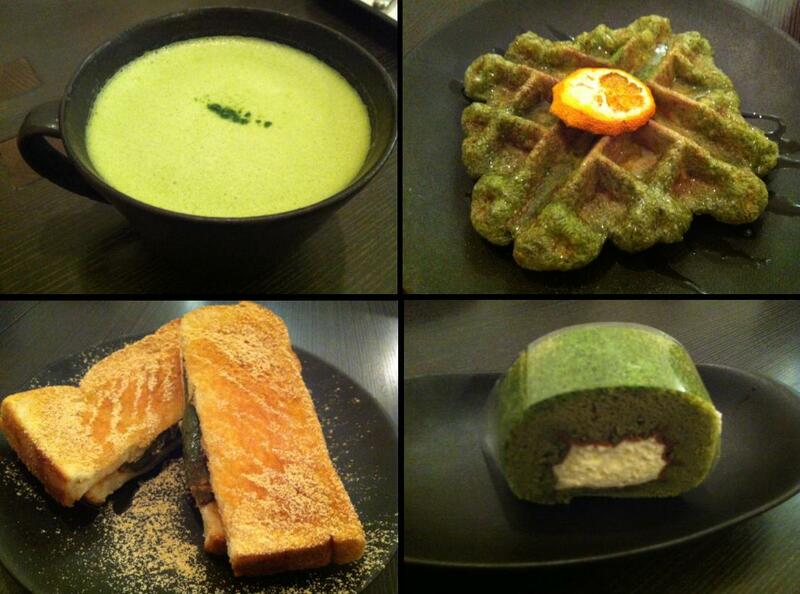 The green tea waffles (top right) contains mochi in it. Therefore the waffle is crispy on the outside, but chewy inside. The toast (bottom left) contains chewy green tea mochi similar to the mochi in the waffles. Green tea latte (top left) is a MUST try for green tea lovers. The green tea swiss roll (bottom right) is sweet and the cream is very light and fluffy. That’s all for the cafes that I visited. 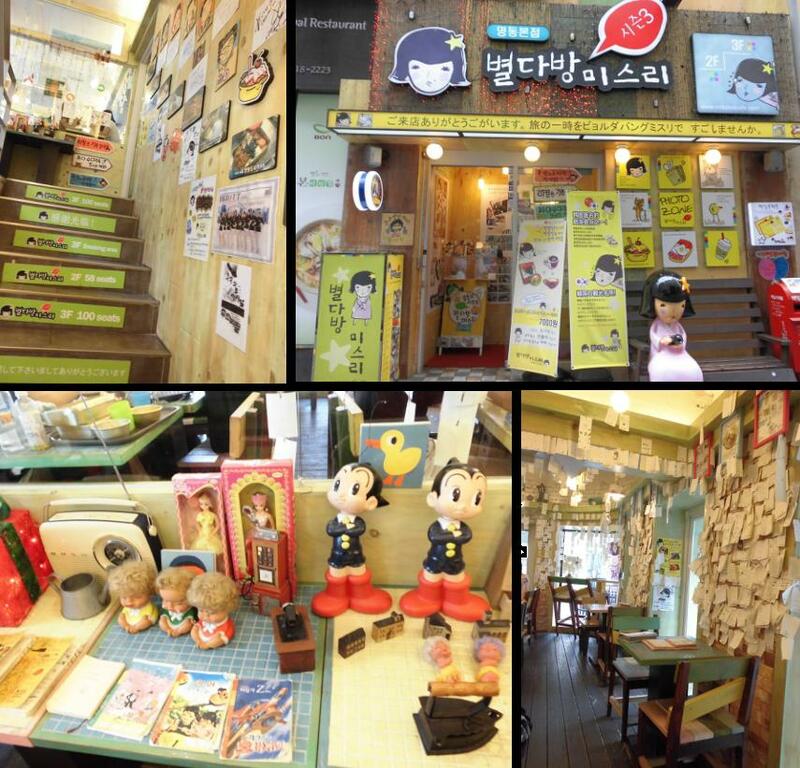 There are many other special cafes which you should visit in Korea. If you are an animal lover, you should definitely visit the Thanks Nature Café where you will get a chance to have a close encounter with sheep! We initially wanted to visit Thanks Nature café but those sheep were not in the café that day due to the hot summer weather. Thanks Nature Café could be found in Hongdae. You might also want to visit the Lily Cat Café if you are a cat lover or the Dog café if you are a dog lover; both cafes can be found in Myeongdong. 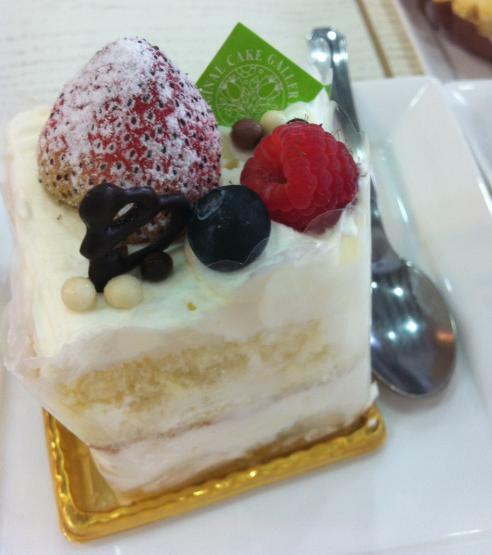 I hope to visit Korea again soon to visit those cafes which I missed out on. Sigh… I miss Korea so much! 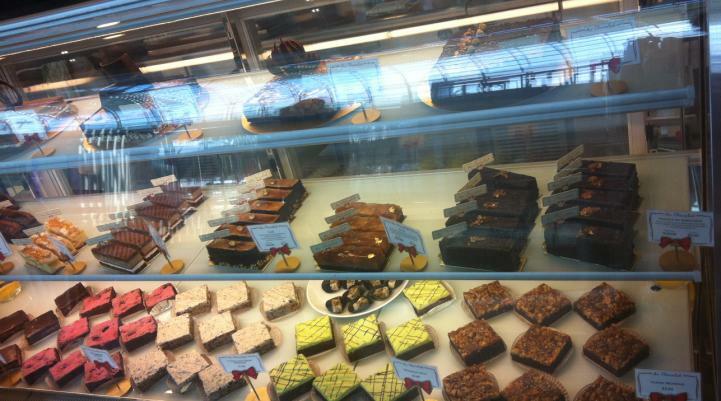 Finding a nice place for desserts or afternoon tea? 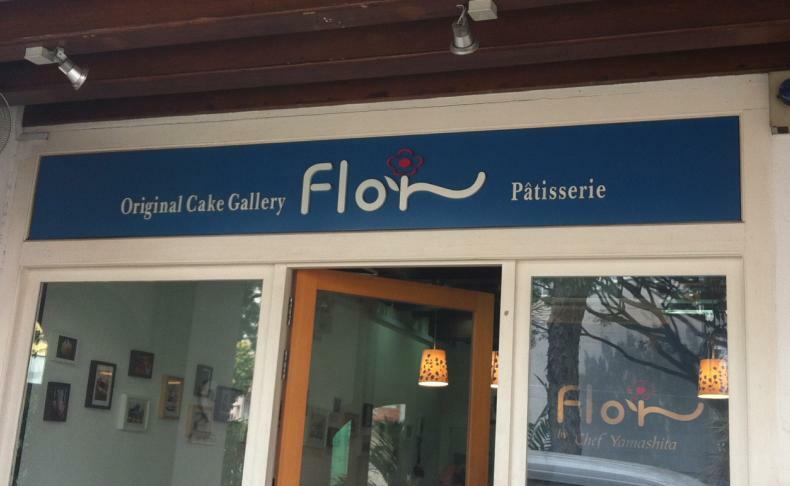 You can try Flor Patisserie. I was there a few weeks ago together with some friends as an advanced celebration for my birthday. The place is quite inaccessible via public transport as it is not near the MRT. However if you are driving, it could be a nice and cozy place to chill out in the afternoon. There is another outlet at Takashimaya Orchard, which is much more accessible. We ordered 8 types of cakes/desserts and it cost around $47 in total. Their Mango dome is awesome! It is a must try for mango lovers. There is a little biscuit-crunch inside the mango mousse. Coconut is used as one of the ingredient for the cake base. Their strawberry shortcake is my next favorite, the sponge cake portion is very soft and fluffy. Strawberries could be sweeter. Their cream is not too sweet, just right for me. 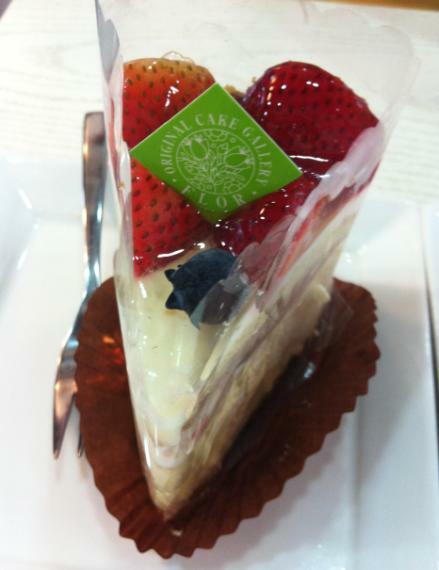 Strawberry Souffle is also very yummy, a little different from Berry Berries as this is a cheese cake. 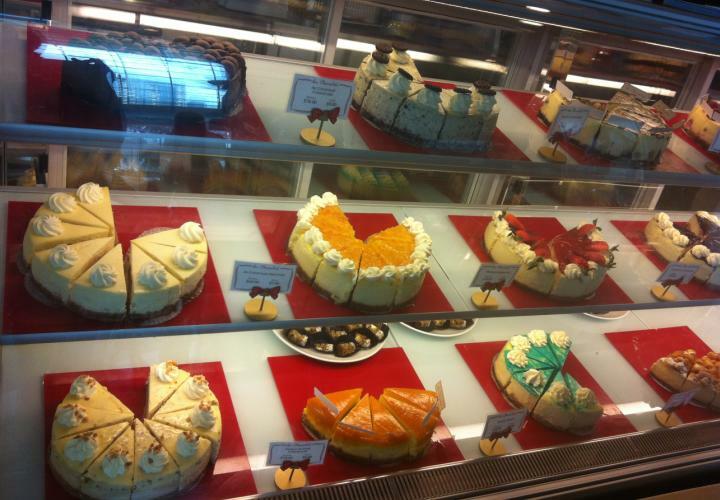 It is smooth and rich but not as heavy as other kinds of cheesecakes. I could eat two! If you like chestnuts and pastries, this is for you. Ordering a chestnut-flavored dessert is something new for me. It is different from what I initially expected but very special indeed. 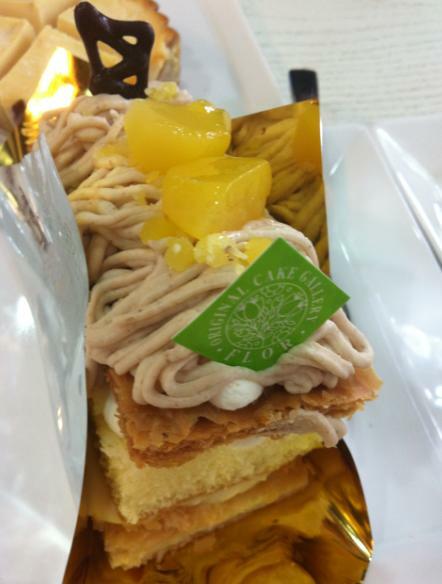 In fact, for pastries lovers, you have to try this. The centre portion consists of a light and flaky puff which is crispy despite the fact that it was topped by chestnut cream. The combination of orange and cheesecake tingles your taste buds with sweet and sour all mixed together. 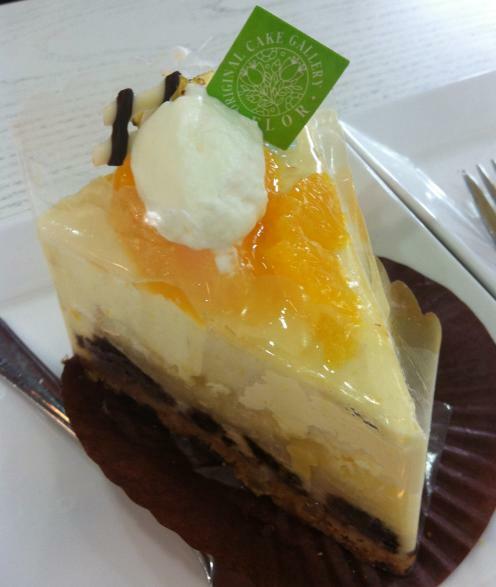 Wonderful combination as the mandarins orange scent made the cheesecake light and craving for more. 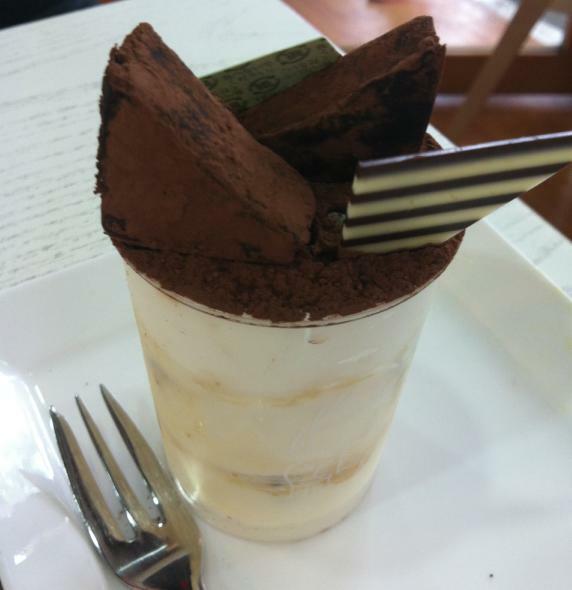 The Tiramisu is something I did not like. The chocolate is too bitter for me. However dark chocolate lovers would love this. 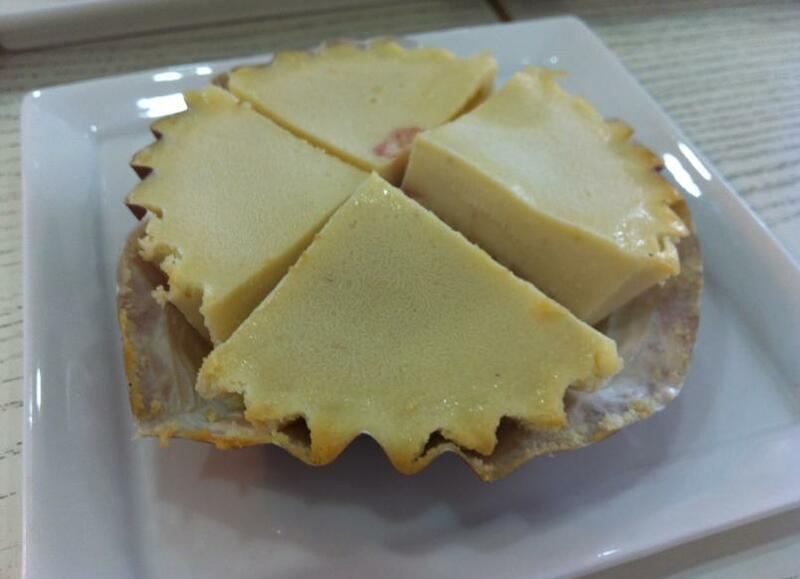 For those who love cheese, you will need to try this Ice cheese tart. Made from cream cheese on top of an almond cookie tart base, they come in different flavors. We ordered the caramel and strawberry ones. Initially I found it difficult to eat because it was served quite frozen, like hard ice cream. After waiting for it to ‘defrost’ a little, the cheese became softer. But I can only manage a quarter of this tart, the cheese is too thick and heavy for me. 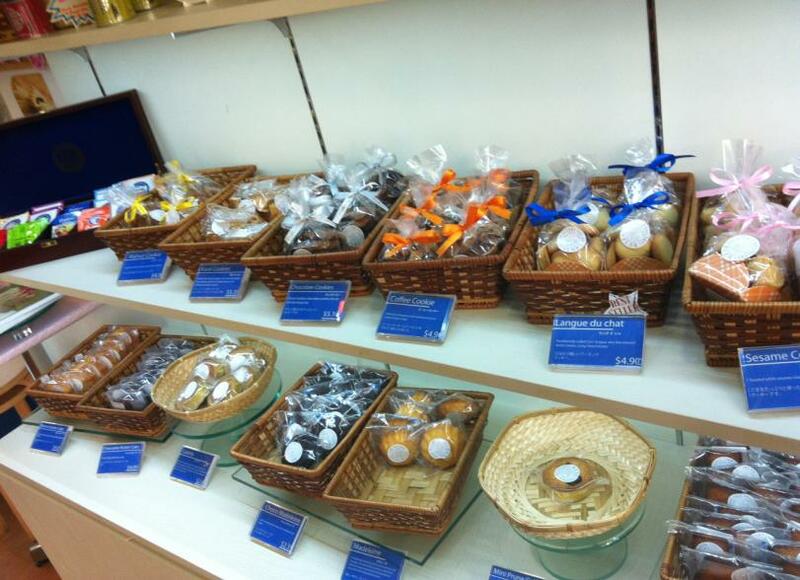 The shop also sells a variety of teacakes & other kinds of cakes. My friend mentioned about Au Chocolat and how special the place was, so I decided that I had to try the food at this place! 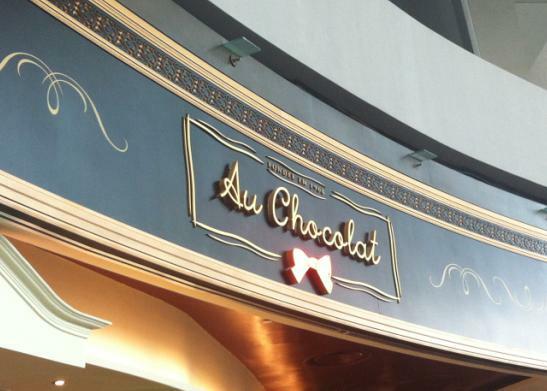 Located at level 1 of Marina Bay Sands, just above the ice skating rink, Au Chocolat is a French-inspired confectionery and bistro. My friend and I decided to have our late lunch there. We arrived there a little later than 3pm and the place was almost packed. 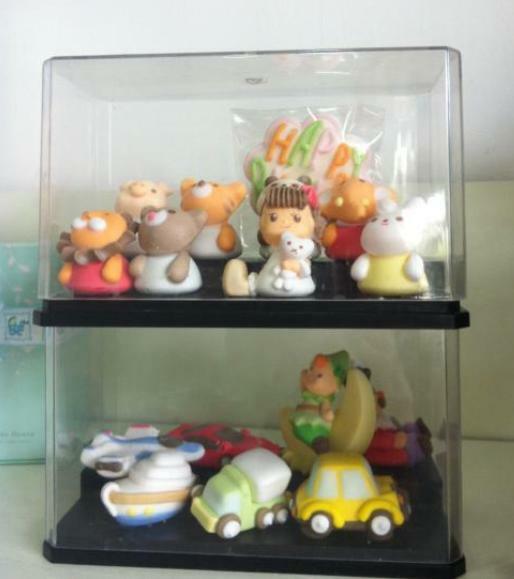 The retail confectionery store sells all sorts of delicious snacks such as slice cakes, cupcakes, macarons, truffle and other merchandise. The interior of the bistro was beautifully themed, I love the ceiling, lights and the train on the railway track above us. Perfect for brunch, girls’ night out, chilling out, high tea or friends gathering. However, I felt that the food is a little pricey. We spent $60 per person. 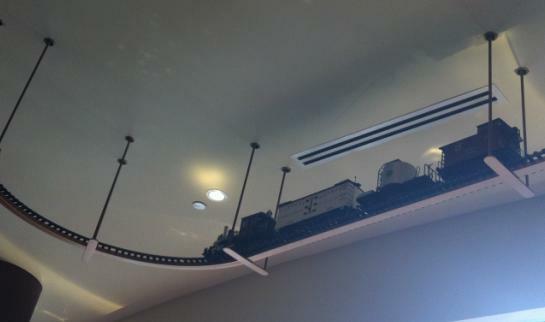 beautifully designed ceiling, notice the railway track that hangs just below it. The train was stationary when we were there. 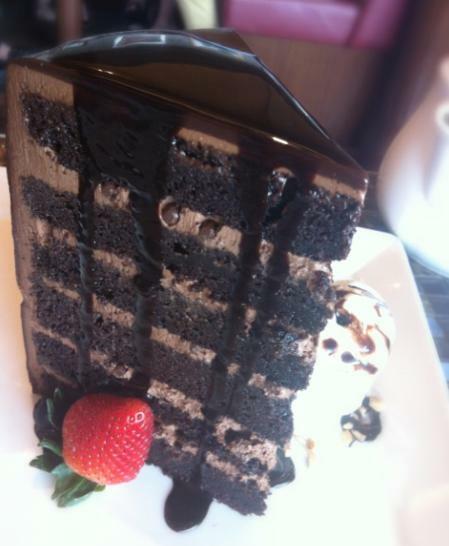 Choc-A-Bloc Tower cake at $18, drizzled with rich chocolate sauce & vanilla ice cream. 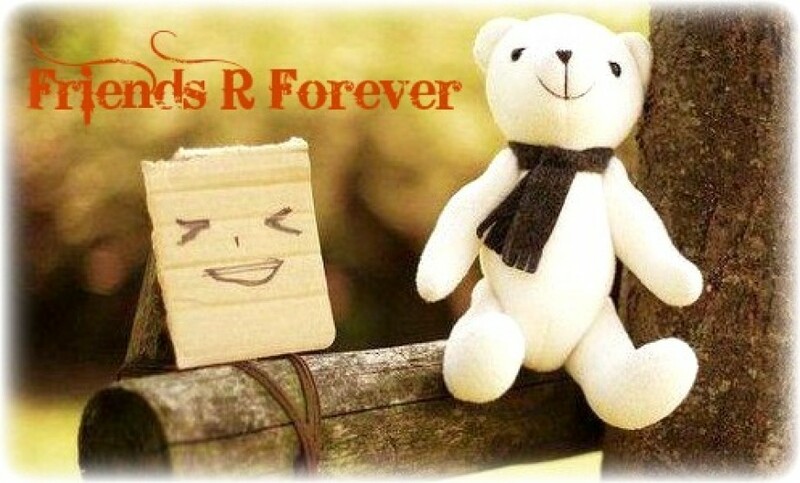 Good for 4 person & above. 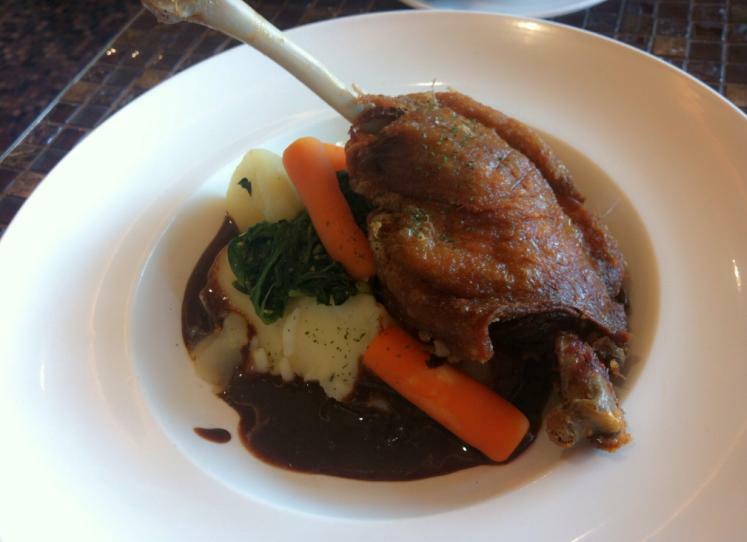 The Crispy Duck Confit came with mashed potato, white wine poached pear and drizzled with tangy chocolate orange sauce. (Definitely one of the must-try dishes when you are dining at Au Chocolat!) The duck skin was unbelievably crispy and the flesh inside was warm and tender. 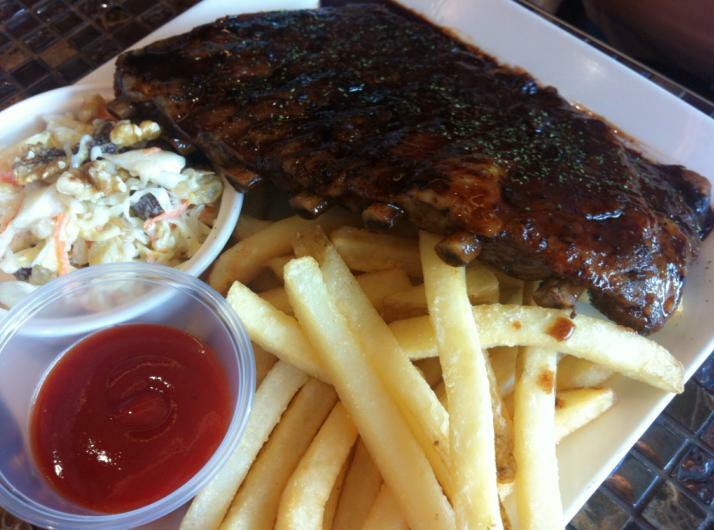 Mocha Pork Ribs, completely marinated and coated with a sinful combination of dark chocolate and gourmet coffee sauce. Finger-licking good!